Eastbourne cricketer Delray Rawlins has been in sparkling form, scoring on his debut, a match-winning century for England U19s against India in Mumbai. 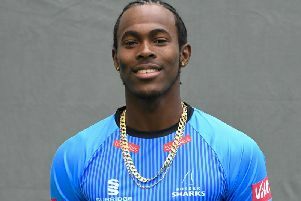 In the first One Day International at the Wankhede Stadium in Mumbai, Delray struck 107 not out from 88 balls, including eight 4s and five 6s, before taking two wickets, as the tourists won by 23 runs. In doing so, he helped England recover from a disastrous start, being 98 for 4 when Delray walked to the crease, to post 256 for 7 in 50 overs. The former Bede’s student followed this performance up by top scoring in the 2nd One Day International with a quick fire 46 from 35 balls and then, unfortunately fell just 4 runs short of another century in the 3rd ODI, scoring 96 out of a total of 215. Delray also took 2 wickets in each of the 3 matches. This was only England’s third U19 one-day win in India and Delray’s performance is the joint second best by an U19 debutant, the record still held by Mike Gatting, who scored 128 against the West Indies in 1976. Delray’s talent was first spotted aged 16, whilst he was attending a state school in Crawley, by Alan Wells, Bede’s Director of Cricket. He spent 2 years at Bede’s, during which time he made regular appearances for Sussex Academy and Sussex 2nd XI, along with captaining the Bede’s Ist XI. Having completed his sixth form studies at Bede’s, Delray was offered a contract by Sussex CC last autumn, joining another Bede’s alumnus, Luke Wells. Alan Wells, said, “This is an incredible performance by any standards, but particularly given the challenging conditions of the sub-continent.